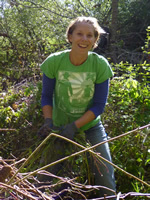 The Resource Conservation District of Santa Cruz County (RCDSCC) is looking for volunteers to help out on periodic field work days. Volunteer duties are primarily field work aimed at removing exotic invasive species followed by revegetation with native plants and possibly helping with our outreach and education efforts. This would be a great way for those interested in the environmental conservation and education fields to get real-world, hands-on experience. It is also a great way for a member of the community to donate their time and energy towards improving their environment.